Omg! The 2018 Fit Planner is FINALLY here! You guys, the Blogifam has been working so hard on it for so long that it feels surreal to finally share it. We’ve been designing Fit Planners for 5 years now! Can you believe it? And I love that every year I can say that the newest one is the best one! Truly! We really listened to your comments on the last planner (all the things you liked and the stuff you didn’t) and took it all to heart. We basically designed this with you guys – you just didn’t know it was happening. 😉 So here are my 5 favorite things about the newest 2018 Fit Planner! Having a seamless, organized, and efficient schedule has a lot to do with being able to visually see what’s on your plate. So that’s why the week view was necessary in this year’s planner. Plus…there’s a little section under the date called “BODY FOCUS” where you can write down what muscle groups you would like to focus on that day! #3. FOOD, FITNESS, AND TO-DO’S ALL IN ONE!? For me, my water, my meals, my sleep and my workouts are just as important as my work! So I love seeing my day in one place, in one compact column. This year we gave you guys even more room for workouts! One thing I really wanted to make time for in the 2018 Fit Planner was journaling. So that’s why at the end of every month, you will see full page recaps with generous space for reflection. This will help you build your personal intuitiveness. #5. THERE’S A MATCHING MINI CALENDAR! I don’t know if I need to say much about this! I mean, it’s cute, it’s rose gold, and it’s matching! It’s also made of thick luxurious greeting card paper! My fave part is that when you flip the page, there’s a quote on the back! This means that when the month is done, you can cut off the page and stick it to your wall to keep the inspo going on throughout the year and forever more! Personally, I am so much more productive and happy when I can write out EVERYTHING I need to do. I schedule my workouts – what time and what Im doing. I plan out my meals for the week. I write down my short-term goals, the things I want to accomplish that week, month, etc. Our lives are so busy that it’s beyond easy to forget something. I’m guilty of it! But when I list it all out, it’s right there for me to remember and cross off my to-do list. But honestly, it’s about so much more than JUST listing out what you need to do. We wanted this to feel personal, to be YOUR journal. We have things like a “self-compliment” box where you say something kind to yourself. We have monthly mantras and dedicated space to plan out any adventures you wanna take. Because really a fit planner isn’t just about physical fitness. It’s about mental fitness and emotional fitness too. It’s YOU. All of you. Every month, you can reflect on what you liked and what you didn’t. You can look at your habits and the goals you set. 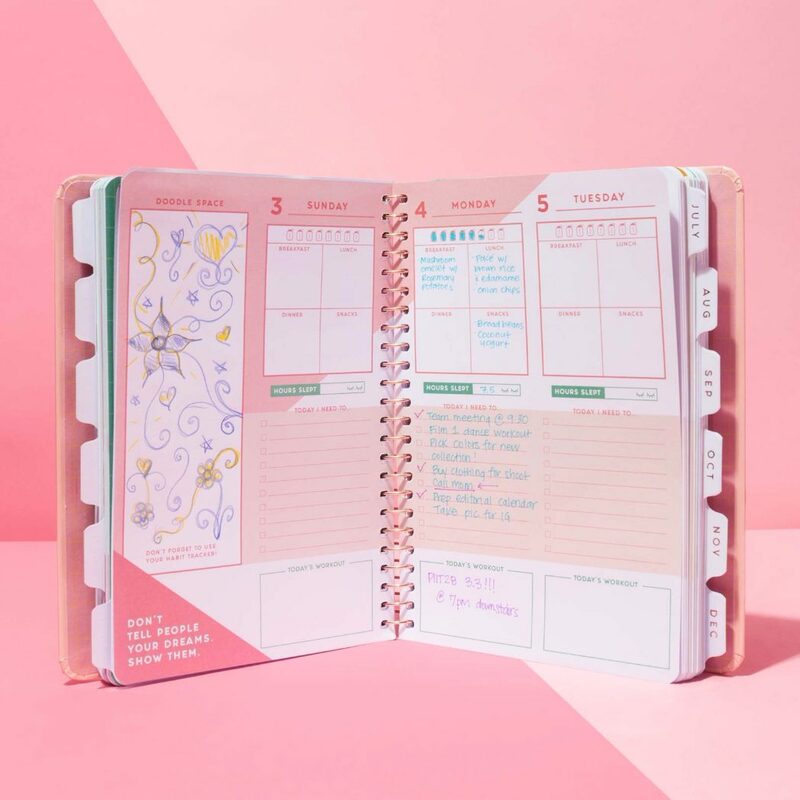 This planner is almost like having a BFF keep you on track. Oh, aaand it’s Blogidoggy approved. She gave it two paws up!! Truly cannot WAIT to what you guys think! Did you guys get one yet!? Sold out? Man there’s gotta be a way to get more! Where can you buy this planner? I cannot find it anywhere. It’s sold out for this year but the 2019 one will be here soon enough! Hi Casey! Any idea when these beautiful 2018 Fit Planner will be back in stock??? I signed up for the let-me-know-when-it’s-available BUT I’m really dying to over over here!! Thanks!! !